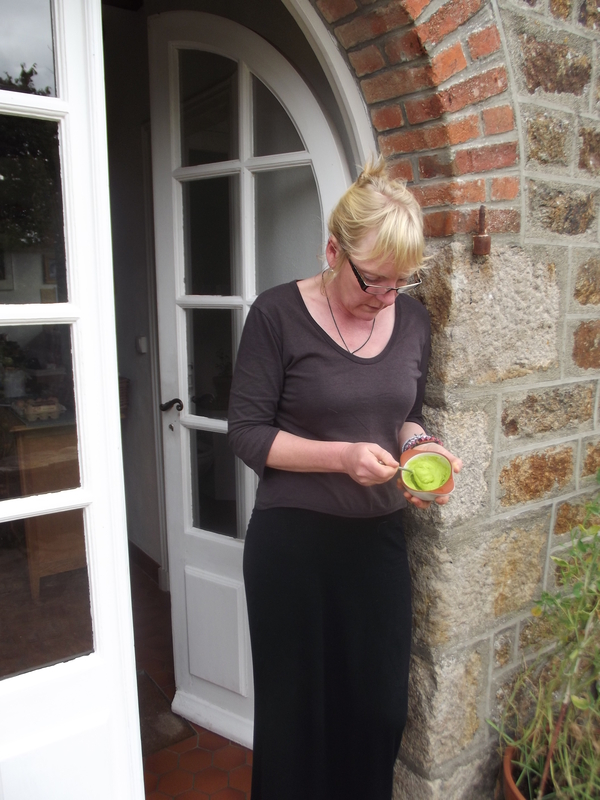 Broad bean pod fritters – pods no longer destined for the compost! 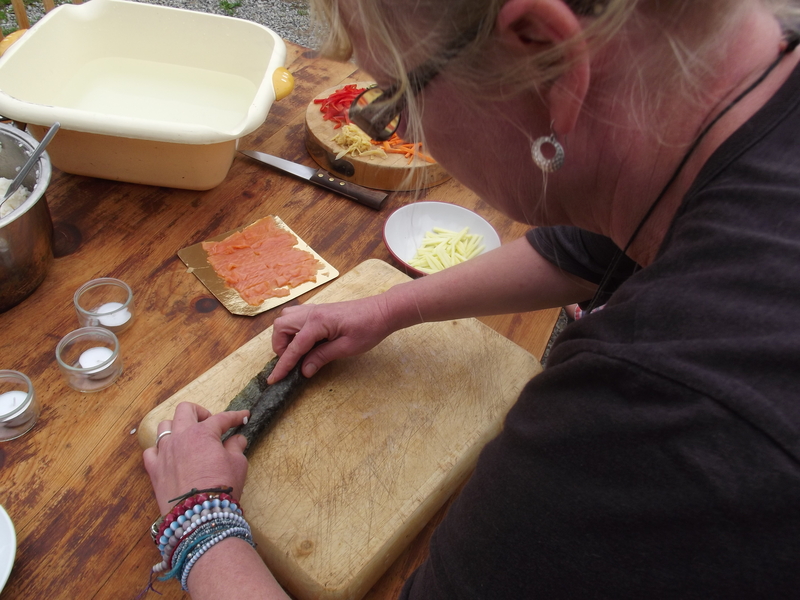 Once your beans have been shucked de-string the pods and then cut into 3 cms pieces – not too uniform though. Season a small bowl of flour with whatever spice blend takes your fancy – I used just cayenne, salt and pepper. Put a mug of milk into another bowl and dredge your broad bean skins into the flour, milk and then flour once more. Deep fry in sizzling oil – twice for a super crunch and enjoy immediately. A great aperitif snack! Top tip – the pods soon discolour once opened so don’t hang around! and blend until smooth – this is sooo good and healthy??? Try adding some red chilli or vanilla or cinnamon too. Serve with some seasonal fruit – we enjoyed this with – you’ve guessed it – cherries! 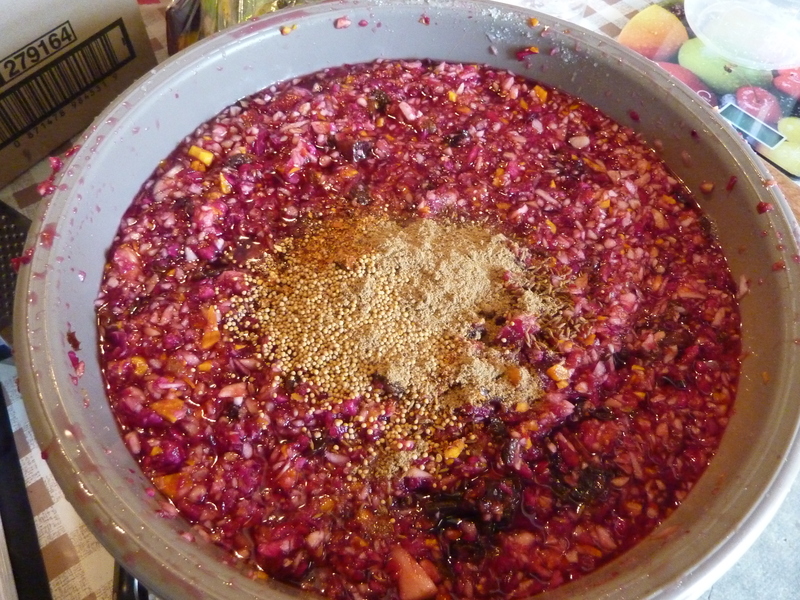 Hull the raspberries and add to the apples, mush them down. Add the sugar, heat slowly, stir occasionally until the sugar is dissolved. You can replace the raspberries with blackberries for blackberry and apple jam. 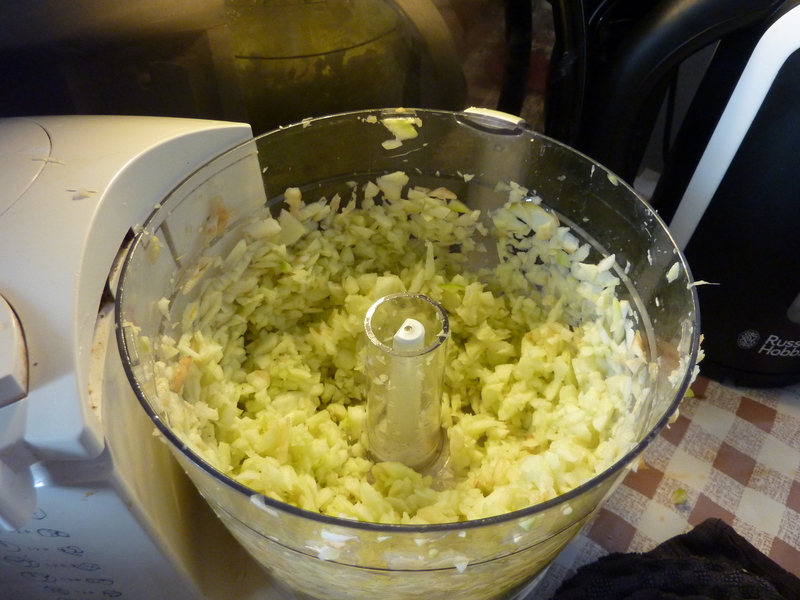 Its easiest to put the marrow into a food processor and blitz it into small pieces. 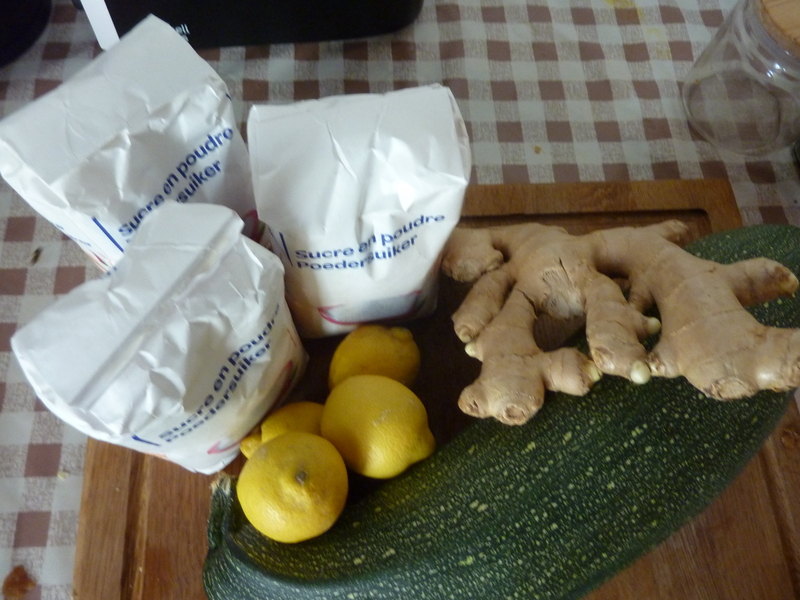 Do the same with the ginger and lemon peel. 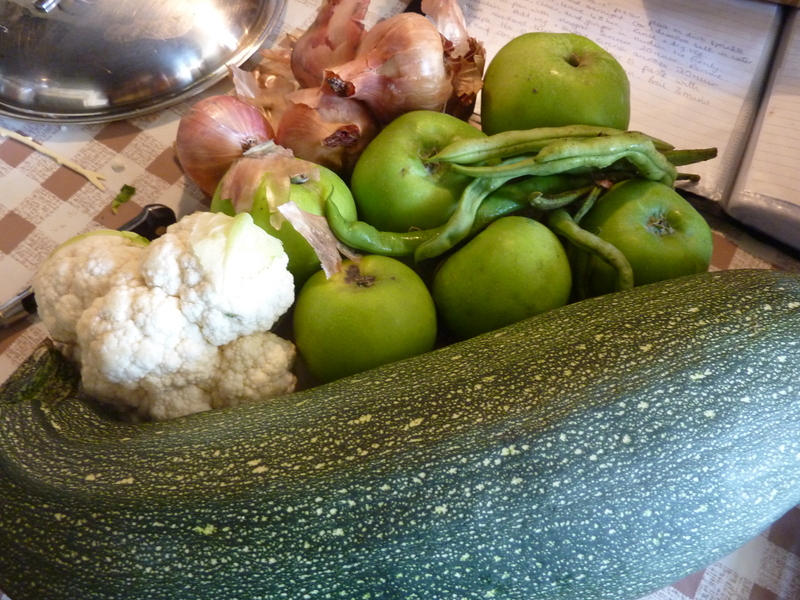 Place the marrow, ginger, lemon peel, lemon juice and sugar in a bowl, cover, keep in a cool place or the fridge overnight. Transfer to a large pan, stirring occasionally and bring to the boil. Simmer for about 4 hours until it reaches setting point. 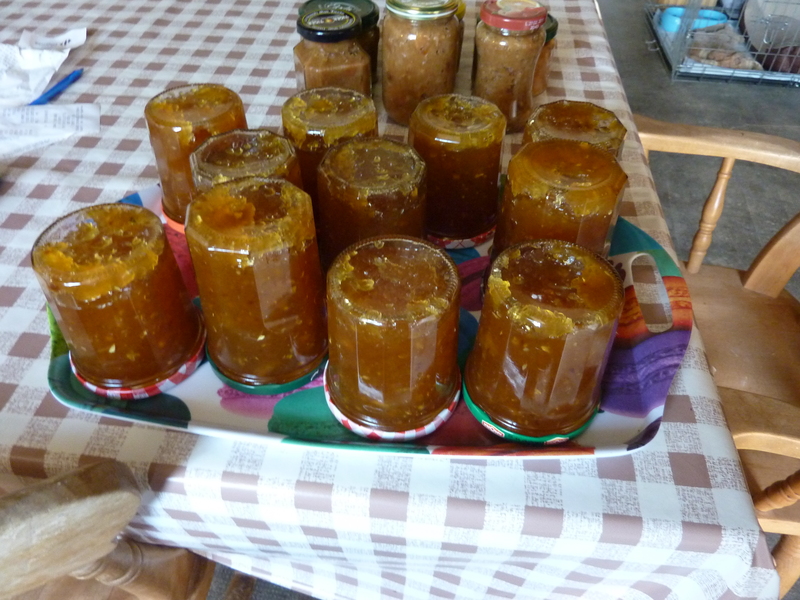 Place in sterilised jars, tighten the lids, turn upside down until cool. As for the marrow and ginger jam, it’s easiest to blitz everything in a food processor. Put all the ingredients in a pan, stir over a medium heat until the sugar is dissolved then bring to the boil. Reduce the heat and simmer for about 1 hour stirring regularly to make sure it doesn’t stick to the pan. 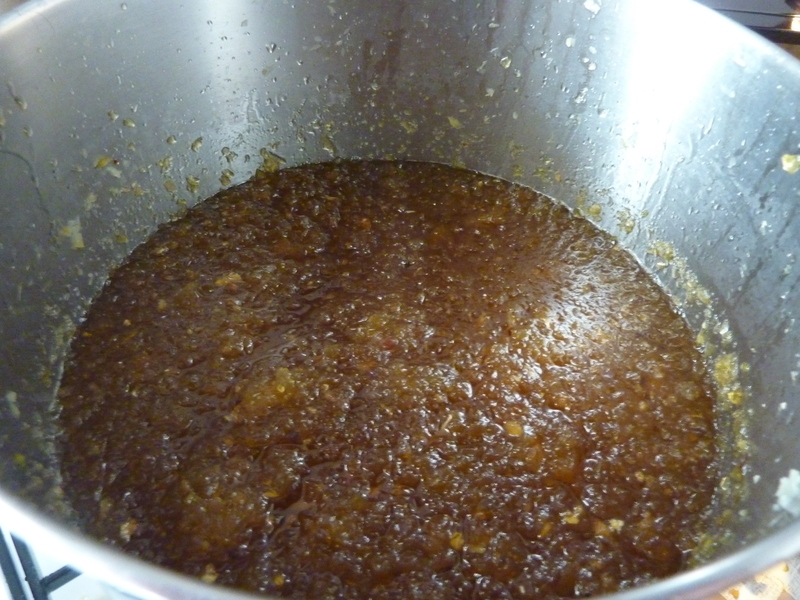 When the chutney is thicker and you can drag a wooden spoon through the mixture and the chutney doesn’t immediately flow back into the gap, the chutney is ready for placing in sterilised jars. Leave for at least one month to allow the flavour to mature. Cut vegetables into small bite size pieces. Place in a dish and sprinkle with the salt. Place the chillies, cloves, crushed ginger in muslin, tie securely and put in a pan with the vinegar. Remove the muslin, add the vegetables and sugar to the vinegar and simmer for a further 20 minutes. 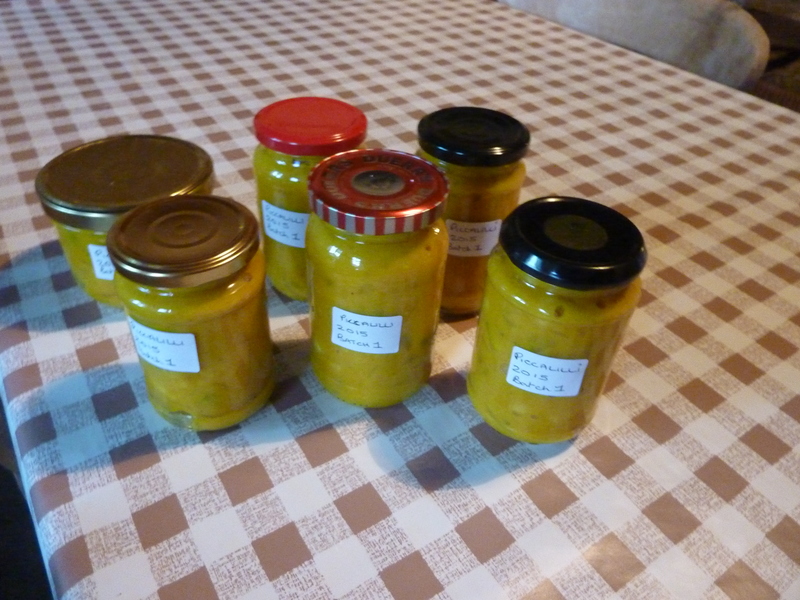 Make a paste with the mustard, tumeric, cornflour and a little vinegar. Add to the pan of vegetables. Boil for 3 minutes stirring constantly. Combine all the ingredients in a container with a screw top lid large enough to hold the fruit and vodka. Shake vigorously then give a shake every day for a week. Shake every couple of weeks. Do this for 3 months. Strain through muslin and bottle. Add extra sugar if necessary. Chop up carrots and onion, place a bit knob of butter in the pan with the carrots and onion, put on a low heat to sweat in the butter until the onion is soft but not brown. Add a can of tomatoes a small tin of tomato puree, enough water to cover the vegetables, a vegetable stock cube, fresh chopped parsley, pepper and salt add the zest and juice of a lemon. Cook until the carrots are soft then put in a liquidizer and blend until smooth. The mix might be quite thick. I leave it like that and freeze. When I want to use the soup I add either milk or water to the consistency I require. Slice the courgettes, chop some onions, a couple of cloves of garlic, an aubergine, and red pepper, sweat all the vegetables in a generous knob of butter with a bit of water if necessary. Add a tin of tomatoes a tin of tomato puree, chopped parsley, pepper and salt and a vegetable stock cube. Cook until the vegetables are tender. I put the Ratatouille in containers and then the freezer. 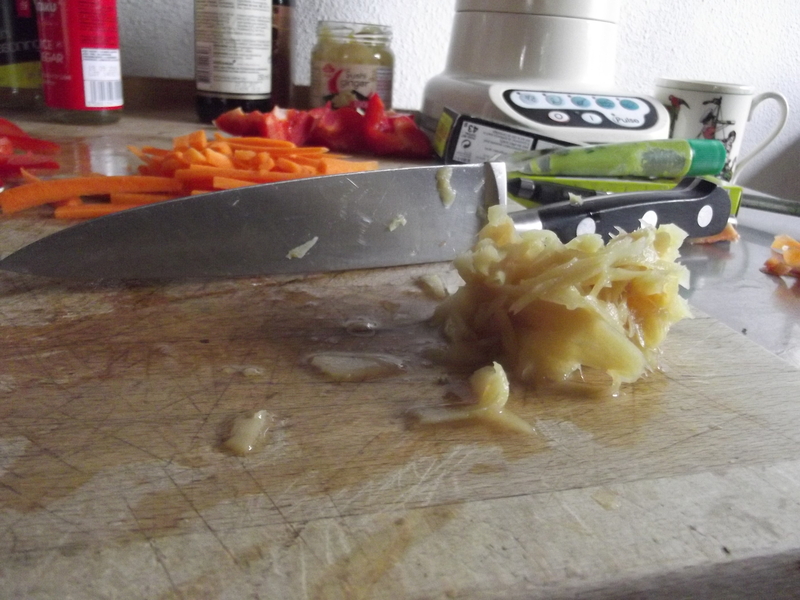 Sweat a mixture of chopped marrow, potatoes, onions, celeriac in butter until the onions are soft but not brown. Add vegetable stock cube, water, pepper salt and parsley. Cook slowly until the potatoes are very soft. Again, I freeze the soup mixture and leave it quite thick adding milk and or cream to make a very tasty rich soup. Cauliflower, leeks and Jerusalem artichokes are also good in this soup. For the non vegetarians crispy fried lardons sprinkled on top of the soup with croutons are delicious. 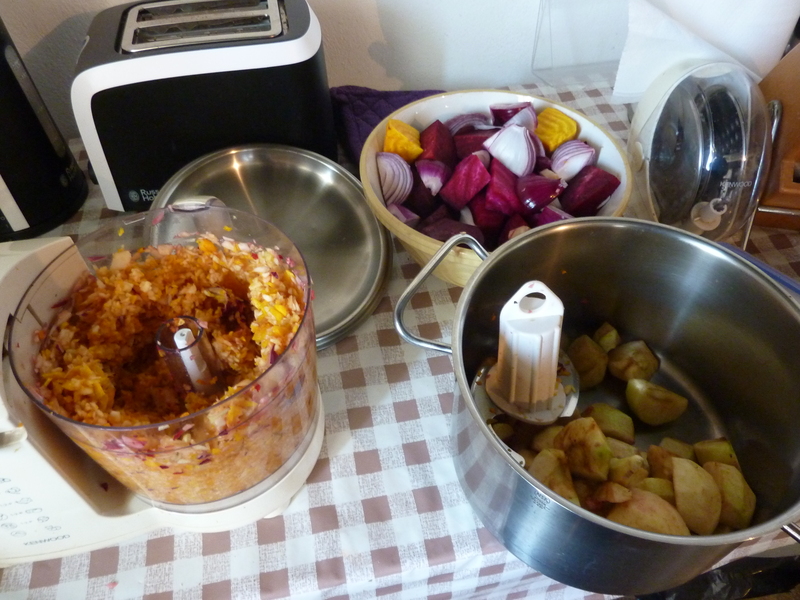 Blitz and peeled beetroot, onions and apples in a food processor so the fruit and vegetables aren’t too small. Add all the other ingredients, bring to the boil then turn down to a simmer and cook for about 2 hours until the consistency is thicker and the vinegar has reduced. A very simple idea for a starter or to have as part of a salad. Grate peeled raw beetroot in the food processor, mix with a small amount of finely chopped onion put in serving dish sprinkle over extra virgin olive oil and white balsamic vinegar, mix thoroughly with the beetroot. You can do this with carrots or celeriac. 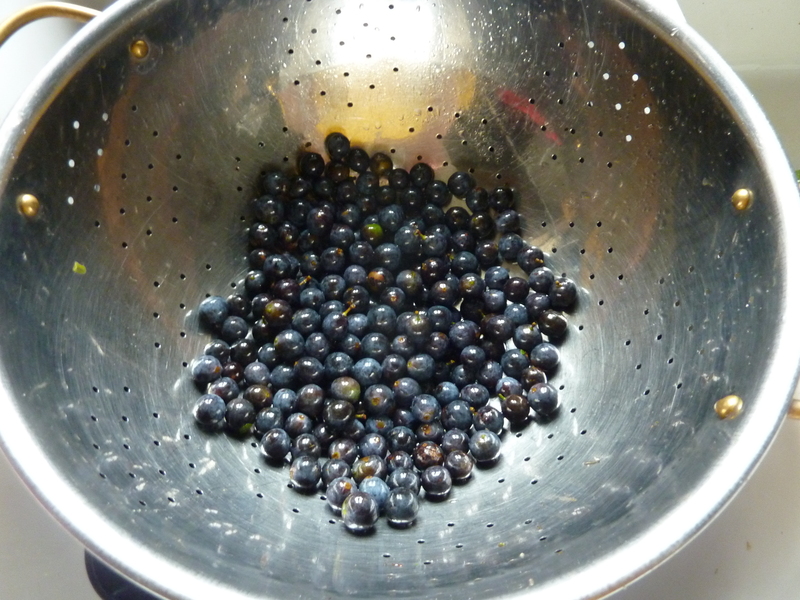 I have also been foraging for sloes, one lot picked in pouring rain the other in lovely sunshine. I’ve picked blackberries for jam but due to time restrictions and lack of pots I have washed and hulled them then put them into the freezer ready for me to make a batch of blackberry and apple jam. A neighbour’s damson tree has given me enough damsons for some Damson Gin and Damson Vodka as well as using the sloes to make sloe gin. I put the washed sloes in the freezer, it softens the fruit and you do not have to prick each individual sloe to enable the juices to be released. 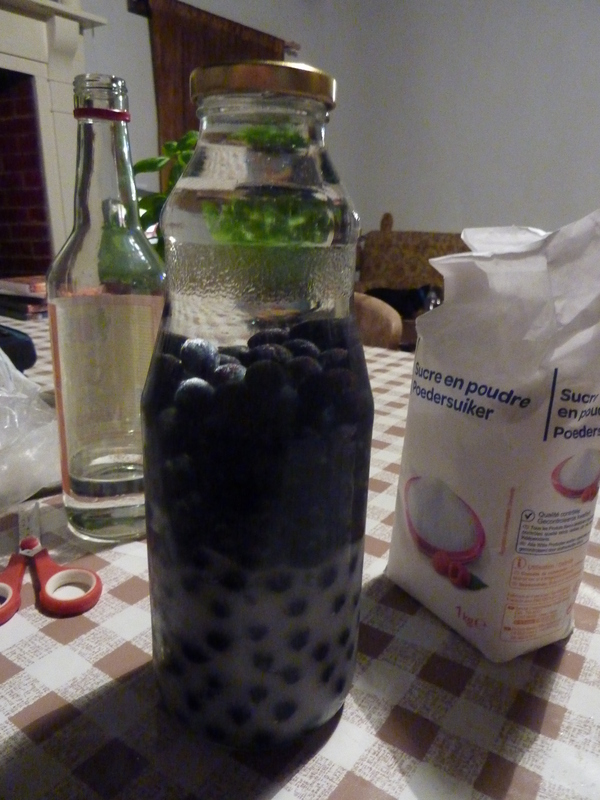 Put the frozen (or defrosted) sloes in a 1 litre capacity screw top jar. There should be enough sloes to fill half or just over of the jar. Pour in sugar, enough to cover the sloes then pour in the gin until the jar is full. Give the jar a good shake, do this daily, then every couple of weeks. Allow to mature for about 3 months then strain through muslin and bottle. Damson gin and vodka are made in the same way except that I do prick the fruit, it’s larger and easier to handle. Please note that there are no quantities given with this recipe. Well, we made this whilst in the throws of preparing for a birthday tea and by eye. 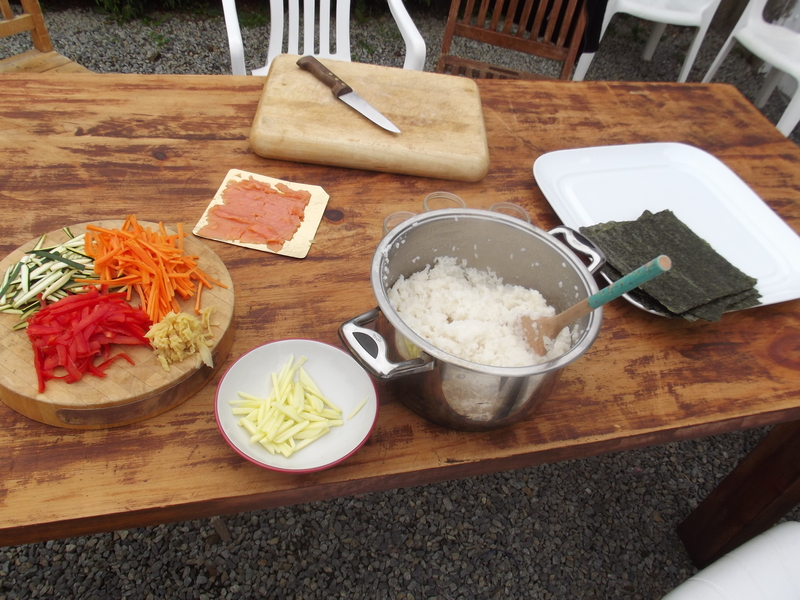 We did cook too much rice – it could have gone in the fridge. 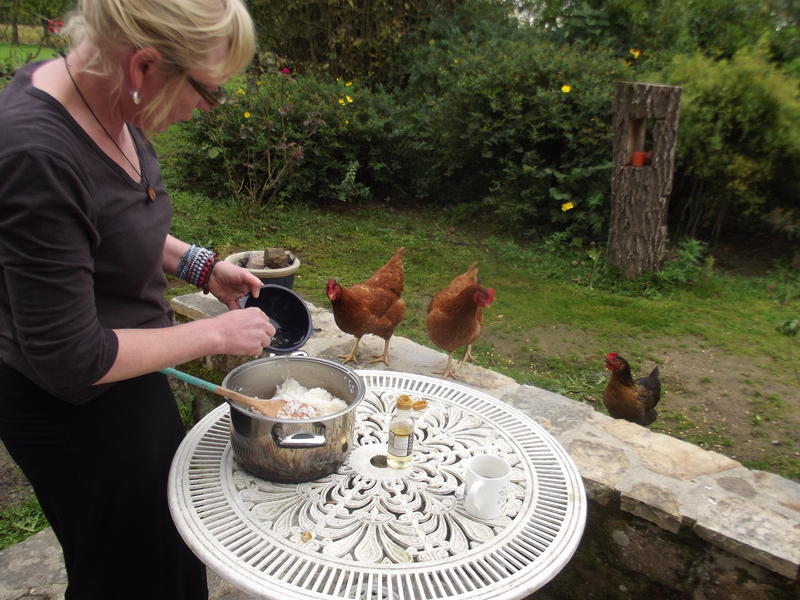 We made the chickens were very happy instead. 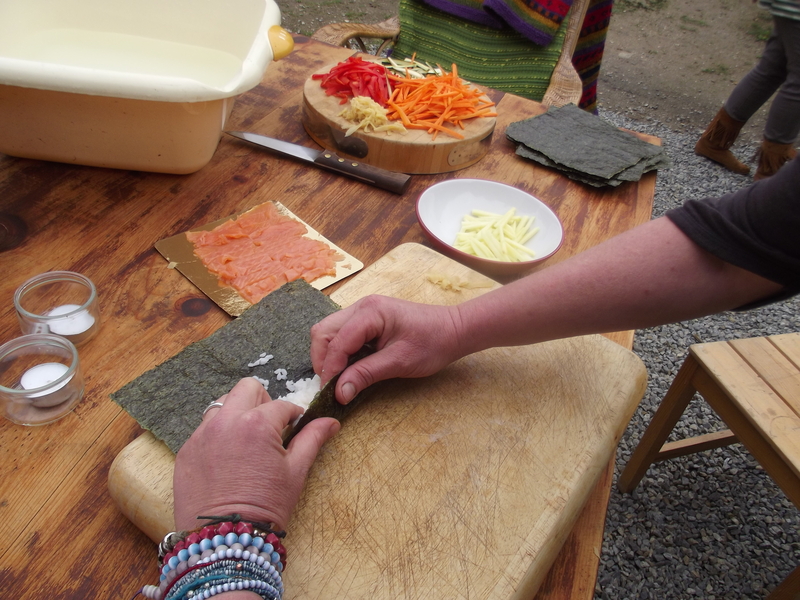 We did toast too many nori sheets which the kids loved munching. The left over fillings become an instant salad. Any left over rice vinegar mix will sit happily in the fridge. and have a read through the method. 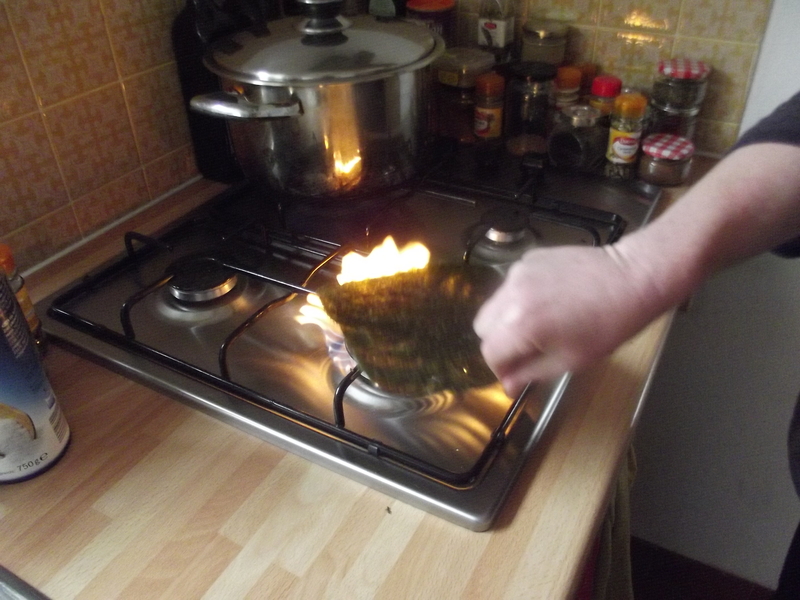 Start by trimming/burning all the hairs on your hands…. 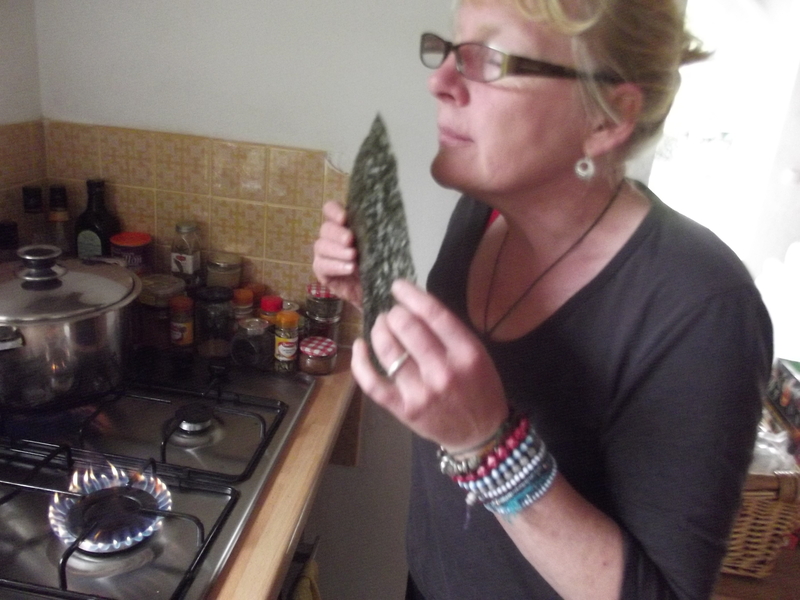 By just waving the nori sheets over a flame for a second or 2 you will bring out the flavour. It’s a risk worth taking. 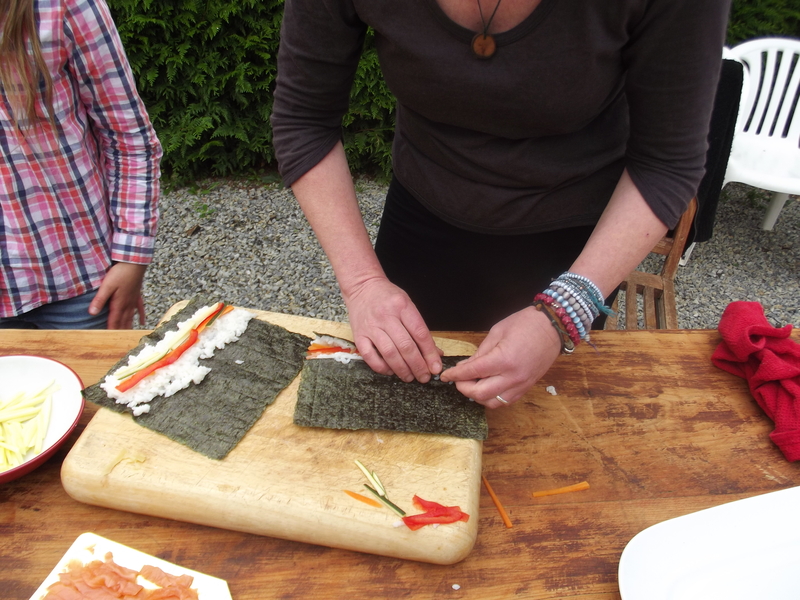 Nori sheets for us here in rural Normandie can be found (along with all the other sushi ingredients) in Asian shops in larger towns & cities, some of the larger supermarkets and if you’re lucky Noz. Cook your rice according to the instructions. Set a timer if you’re easily distracted! Beware sushi rice is not cheap but feel relieved to know that Thai rice is cheaper and works just as well. Nice thin slithers of things you like…. peppers, cucumber, carrot, finely chopped pickled ginger….whatever floats your boat. We tried adding some apple as we are surrounded by them at the moment – go crazy folks! 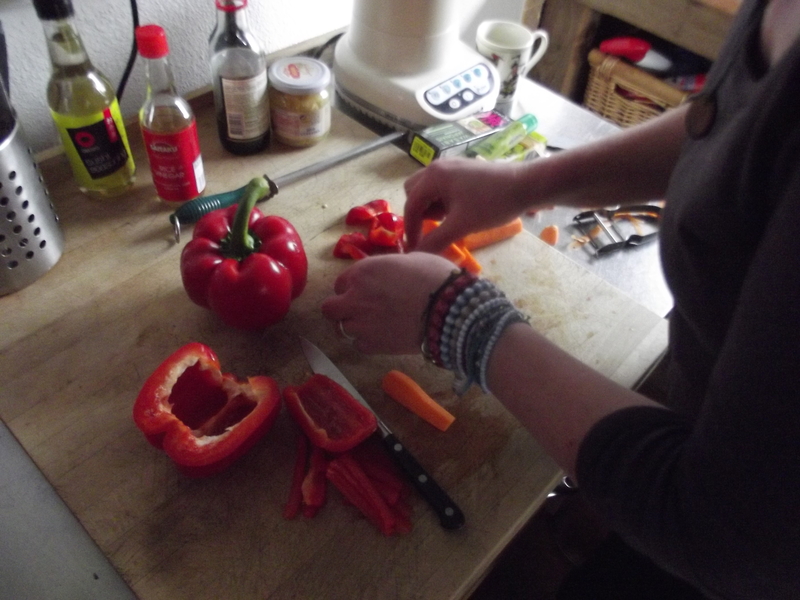 Try a veg peeler on the peppers and use the green edges of the cucumber – it looks prettier! Once the rice is cooked leave it to sit and prepare the vinegar. Pour rice vinegar into a bowl and add sugar and salt to taste. Stir until the sugar and salt dissolves. 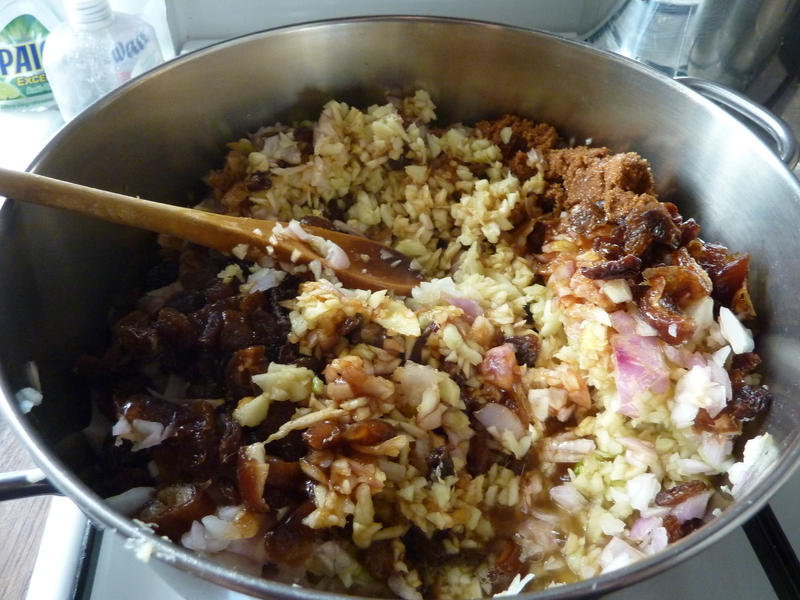 Stir the vinegar mix into the sticky rice and leave to cool. The rice should be sticky not swimmy so add slowly. You may not need it all. Get all your bits ready to roll – literally. 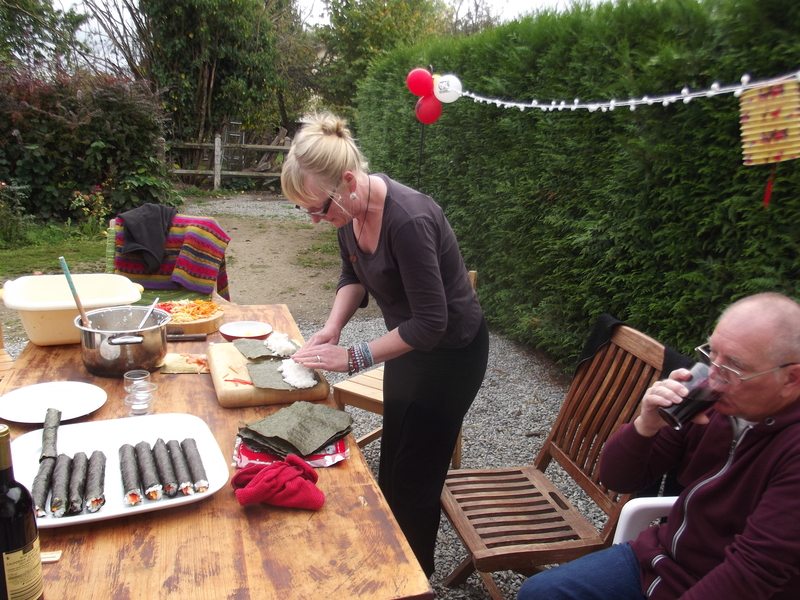 Note we’re not using a rolling mat – not needed. Ok, so, have a big bowl of tepid water and a clean tea towel near by – you will be rinsing your ricey fingers regularly. 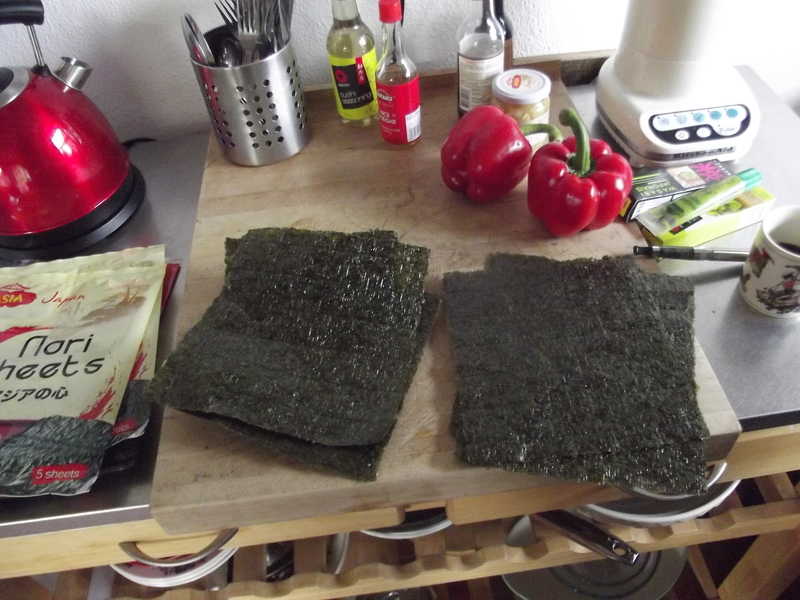 Take a nori sheet and lay it on a board so the lines run vertically away from you. Get stuck in. Spread a nice line of rice along the bottom of the sheet. When it’s evenly spread rinse those pinkies. 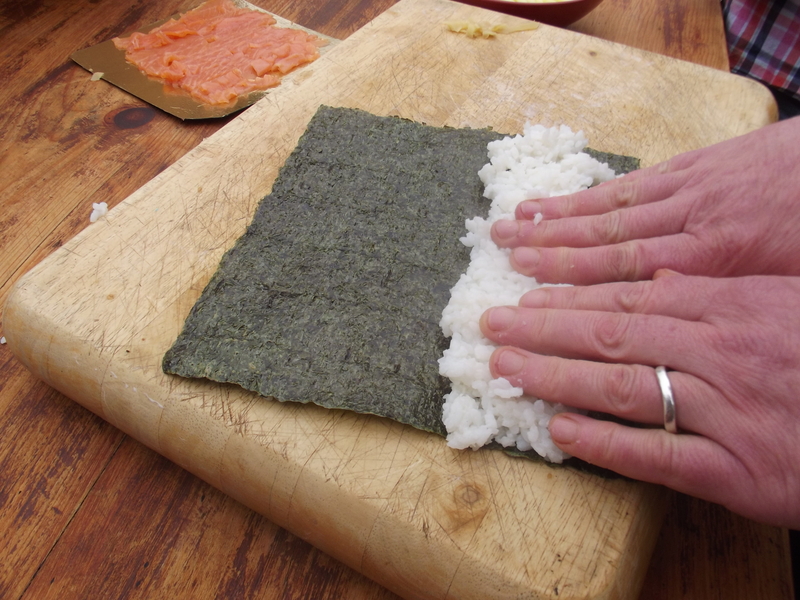 Decide on your filling for that roll and push it into the rice – all neat and tight. Start to roll it up. Think tight & even! Use your thumb to support the underside of the sheet and your index finger to keep it all tucked and roll. 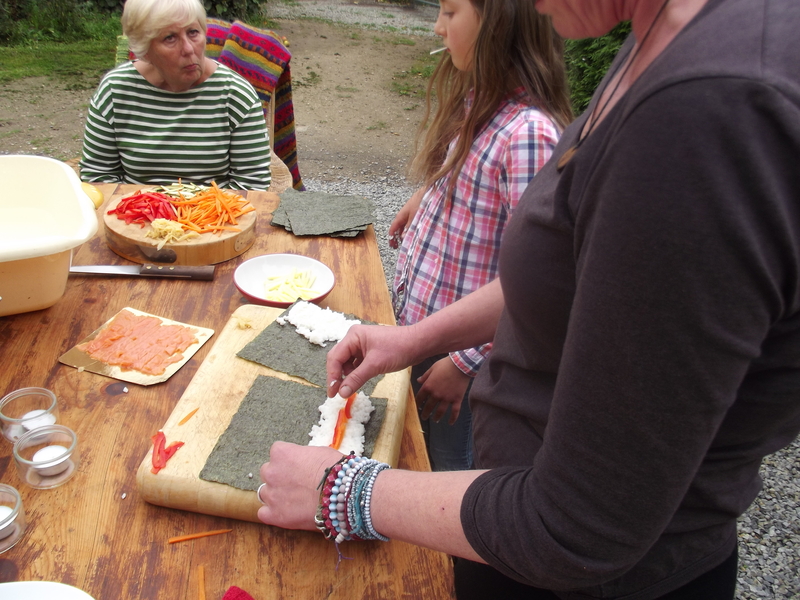 Roll it all the way up and leave your rolls edge down to sit for a while. 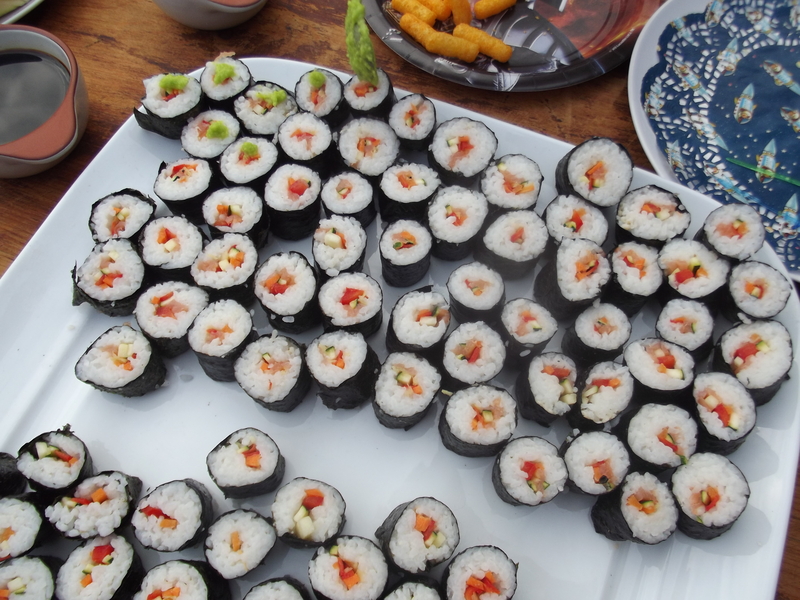 Look at those bad boys – I mean the sushi. Time to think about the accompaniments. Soy sauce, wasabi, pickled ginger – mouth watering delights. 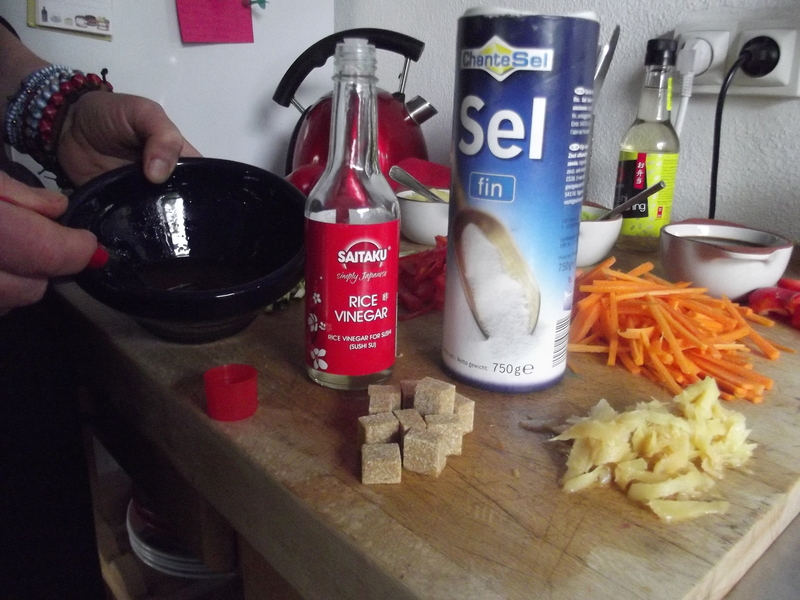 Soy sauce and pickled ginger – easy – out the bottle/jar and into small bowls. Squeeze your wasabi out the tube and into a small bowl. Carefully thin it down by just adding a few drops of cold water at a time and stirring well. Your wasabi will go so much further, looks nicer and is easier to spoon. Get cutting your rolls. The edges won’t sit so nicely or look so profesh so you may want to cut them off and munch them – chef’s privilege. Try and cut them evenly. A sharp knife for this is a must.